Type reports and outlines in a variety of fonts, sizes, colors and styles. Text automatically reflows around images. Handwriting has been fine-tuned to be smooth and expressive using a trackpad or mouse. Sketch and write using a variety of colors, line widths, and styles. Record audio during lectures and meetings to capture more detail. Import audio recordings from other sources. Notes are linked to audio recordings, so you can watch your typing and handwriting play back while you review a lecture or meeting. You can also use note replay to give audio feedback to students or colleagues. Notes added during note playback will also link to the recording. Import and annotate lecture slides, meeting agendas and PDFs. Fill out and sign forms. Use all the tools to mark up photos, maps, schematics, and more. Organize your notes by subject. Backup your notes to Dropbox and Google Drive automatically. Share your notes with study groups and colleagues via email, Airdrop, Dropbox and Google Drive. 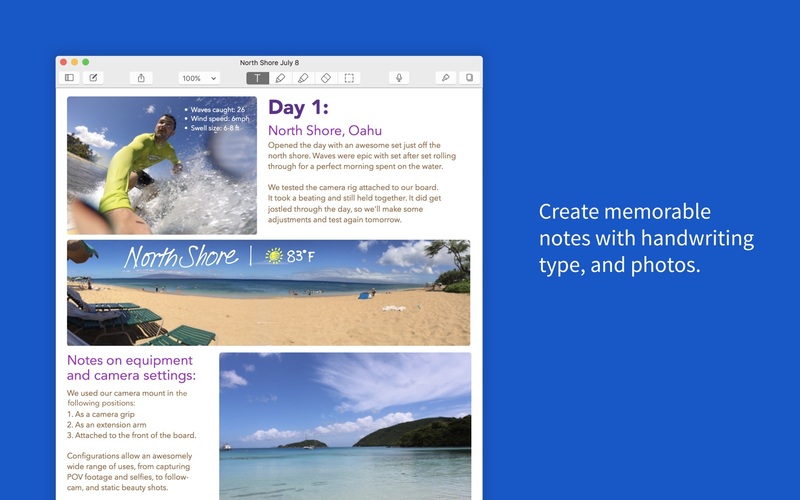 iCloud syncs your notes on iPhone, iPad, and Mac. Make sure iCloud is turned on in Notability on iPad and iPhone to sync with your Mac. Next story Microsoft Outlook 2019 16.21 – Messaging client for the Microsoft Exchange Server. Previous story Microsoft Word 2019 16.21 – Powerful and beautiful word processor. Day One 2.1.2 – Maintain a daily journal. Quiver 2.1 – The programmer’s notebook.